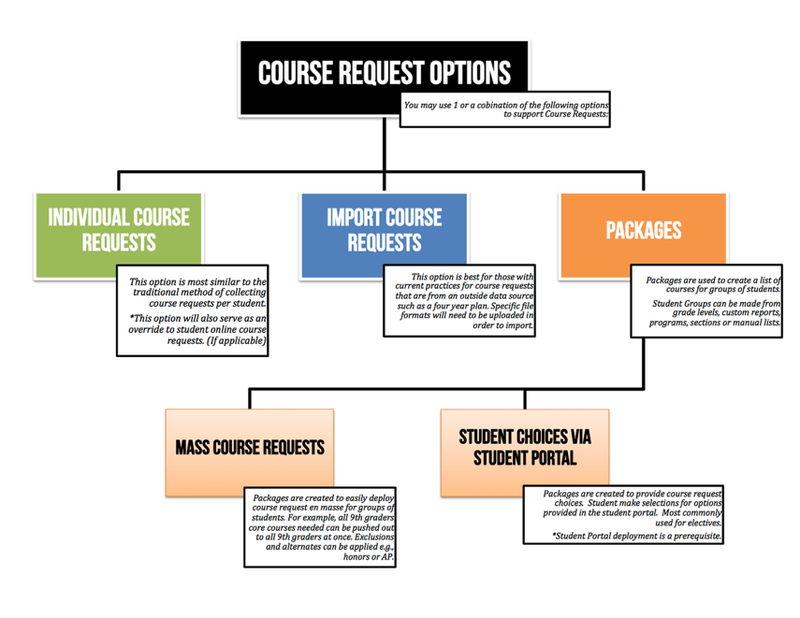 The following image is a flow chart to show the various options available for Course Requests. Options can be used alone or in combination of each other. Individual Course Requests are similar to how course requests are traditionally collected, student by student. Visit 2.1a Student Course Requests (Individual Student) for details. The Import of Course Requests is a viable option if current course request practices are used in an outside system or unique entry method. Data will need to be in a specific file format for a successful import. Visit 2.1b Importing Course Requests for details. Visit 2.1c Packages (Mass Student Requests) and 2.1d Packages (Online Course Request Via Student Portal) for details. Get started with Course Requests by visiting 2.1a Student Course Requests (Individual Student) .